Have artists always been outsiders? 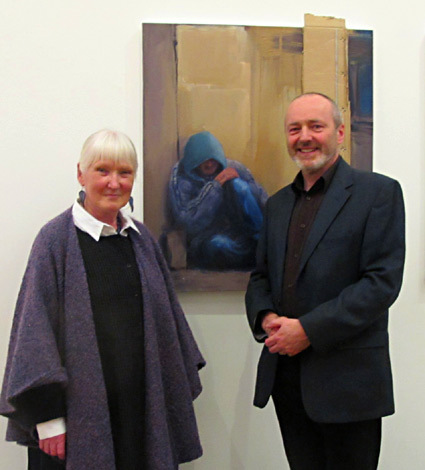 I have been visiting Port Laoise for the last few years, teaching art in the prison and working on various Artist-in-Prison projects, so I was delighted when I got the opportunity to exhibit my work at the Dunamaise Arts Centre. We had the opening there on Friday night and, several people had travelled a good distance to be at the show, from Dublin, from Tullamore, from Abbeyleix, even from as far away as Carrick-on-Suir. It was lovely to meet everyone, although I have to say that for me, I’m generally too stressed to be able to have a decent conversation with anyone on the night. But that said, I really appreciate people coming to the opening. So why the stress? – well, it’s the speeches. I wouldn’t mind, I always like hearing other people’s speeches, and Mark Kavanagh, the principal teacher in Port Laoise Prison gave a very moving speech at the opening but, when I’m up there, in front of the crowd… (gulp) – it’s frightening. But I think it’s important so I always try to do it. I wanted to do it especially last Friday because I wanted to talk about Trust – a charitable organisation that looks after the needs of homeless people. The founder of Trust, Alice Leahy was in the crowd and I wanted to acknowledge her presence. I felt honoured that she had decided to come to the show. Congratulations Eoin, I am sure you made a great fist of the speechifying, as well as a great show!